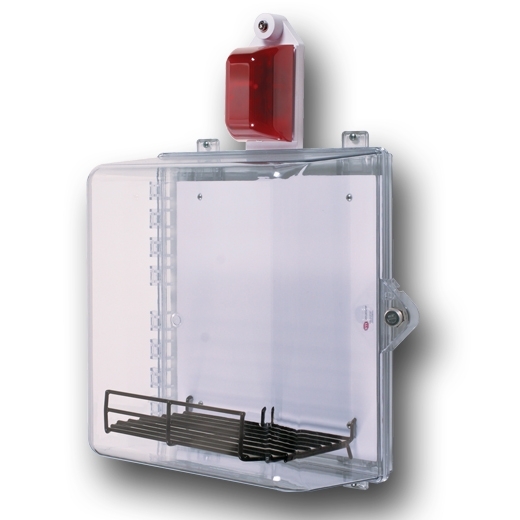 STI’s see-through polycarbonate cabinet offers protection for Automated External Defibrillator (AED) units. The cabinet comes with Select-Alert alarm/strobe (STI-735AED), which allows the AED to be highly visible while the alarm helps guard against theft and vandalism. It mounts on the wall and is secured with a thumb lock. With independent strobe and siren timing (15, 30, 60 seconds or continuous), the alarm length can be adjusted for multiple settings.